In yesterday's post about my designs from last winter and new ones by Burda that look like them, I hope I didn't suggest these things I made were groundbreakingly unique stuff. I know they were not. In fact, I never really regarded the dress as a real original design by me. I made it after seeing these pictures in fashion magazines (the one on the left is from Brittish Vogue, the one on the right from Dutch l'Officiel). The dress shown there is by Dior and apparently came in at least two different checks. Even when I made it, I knew there were patterns available for similar designs. I just prefer drafting my own because they always fit and I can get just the detail I want. 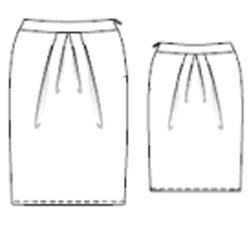 Actually, this Vogue pattern may, as far as I know, pre-date the Dior design. style (which I had made before). 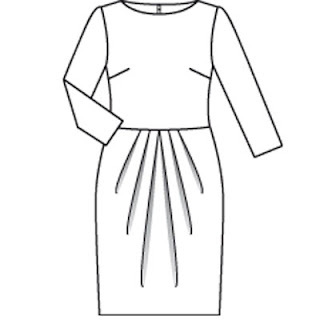 Combined with the bodice sloper, uploaded by member JJ, it could become a sleeveless version of the same dress. Are they all essentially the same dress? Is any one of them the 'original design' and are all the others rip-offs? Are they all originals, because none of them is quite the same as the others? It's hard to say anything about it, especially because I don't know whether I'm looking at nearly all of them here, or just at one small branch on the sprawling family tree of tulip skirt dresses. They look a bit vintage-y, so they might all be based on a certain range of dresses back in the 50's. 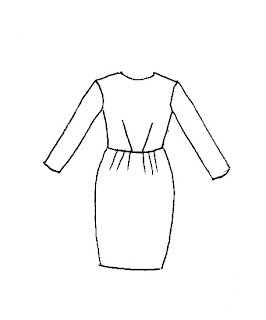 And what is true for the line of tulip skirt dresses, is true for almost every piece of clothing you'll see anywhere. Fashion has kept such a fast pace for the past decade, it's forever recycling and reinventing and no one wants to be left out. There's a fair bit of copying going on out there, but also a lot of cases of 'same ideas because the time was right'.